This 4-step exclusive luxury set contains hair care essentials for the most damaged hair. Shampooing Reviviscence: Using a small amount, apply to wet hair. Emulsify using small amounts of water. When a gentle lather builds, rinse thoroughly (lather will be minimal). Masque Quintessence: After shampooing, squeeze out excess water and apply to length and ends. Leave on 2-5 minutes then rinse thoroughly. While rinsing, comb through your hair for perfect detangling. Use as a weekly intensive treatment: apply on dry length and ends and leave on 20 minutes BEFORE shampooing. Lait Luminescence: Shake before use and spray a VERY small amount throughout hair. Comb through, then blow-dry or dry hair naturally. The best collection for 3c/4a hair types! I have been faithfully using Leonor Greyl for about 10 months now, and the change I have seen is unlike any other! As a certified product junkie, I have tried it all from the drugstore to high-end brands. I decided to take the plunge and purchase the collection in hopes to finally stop the constant breakage with my hair. The shampoo has made my hair so much stronger, and it perfectly cleanses my hair without the “strip clean” feel. I do also use the oil every so often the night before I wash my hair, but the true gem is the mask: it is the ultimate game changer! My hair is now softer, stronger, and I lose way less when I detangle my curly hair! 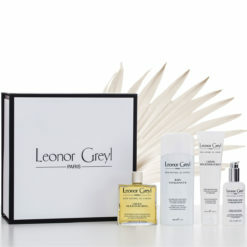 I know Leonor Greyl carries a curly hair collection, but honestly buy this set because you will not regret it!